Just because I have girls doesn't mean they don't like to play with "boys" toys. My husband, who is still at kid at heart, enjoys every opportunity he gets to get down on the floor to play with the girls with a train or race car set, when he is not letting the girls do his hair, paint his nails, or dress him in and add flashy accessories for a tea party. Having grown up with two older brothers, I also have experience and know how fun it is to play with cars, trucks and even tractor toys. 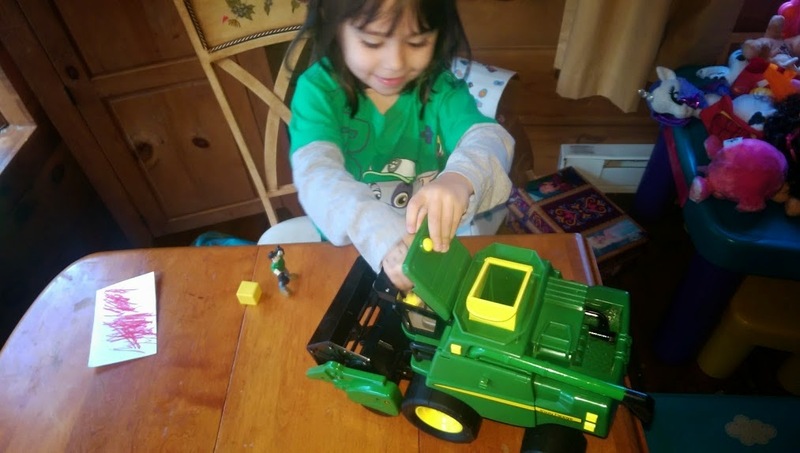 :-) So, when I was asked if I had any interest in reviewing the new the brand new ultra-powerful Harvest Action Combine in the John Deere Gear Force fleet line, I jumped at the opportunity, as I knew this toy would be perfect for the girls and my husband to help me review. Living in the country here in CT, our house is positioned between a horse farm and open land which is always filled with hay bales or tractors mowing the fields of tall grass. On any given day in the warmer months, especially during the summer, you will find tractors going up and down our street, as well as riders taking their horses out for some exercise. Even though I never grew up or worked on a farm, there is something about watching farmers tend to their land and crops that is fascinating. And, when you see big machines and tractors working the land, you can't help but wish you could climb in and go for a ride. 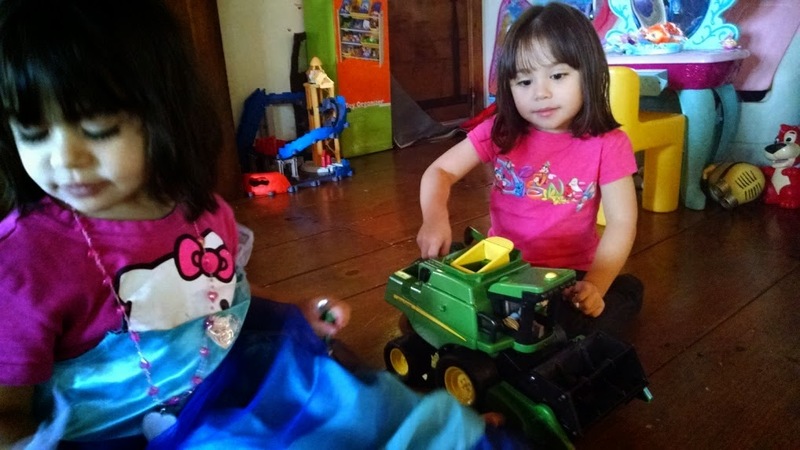 My girls feel the same way, and have developed a love for tractors both big and small. Whenever we go to the local 4H fairs, the girls are quick to watch the tractor pull competition, climb into a tractor to enjoy the view from up high, or simply admire and be in awe of the gigantic tires many of the farm tractors have. 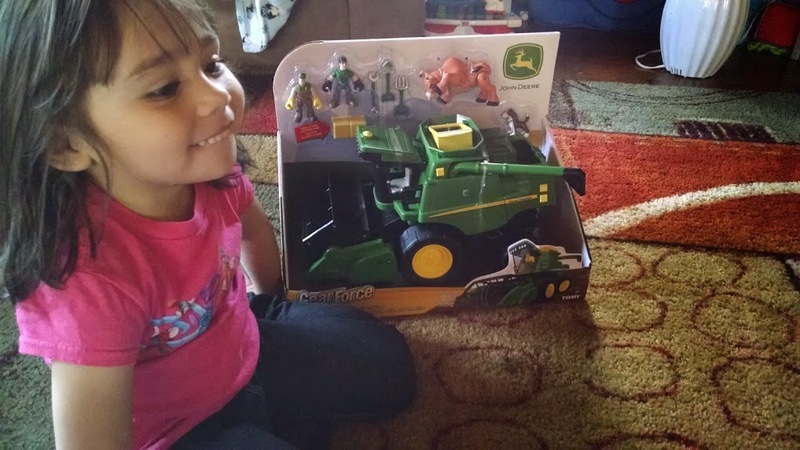 My daughter, Savannah, loves John Deere tractors so much that when we were trying to break her of her binkie habit when she was two years old, she asked for a ride on tractor in our compromise, with the one stipulation being that it had to be a John Deere green. We bought her her very own ride on tractor toy and she handed over her binkie. :-) And, from that point on, she has been known as our John Deere girl. 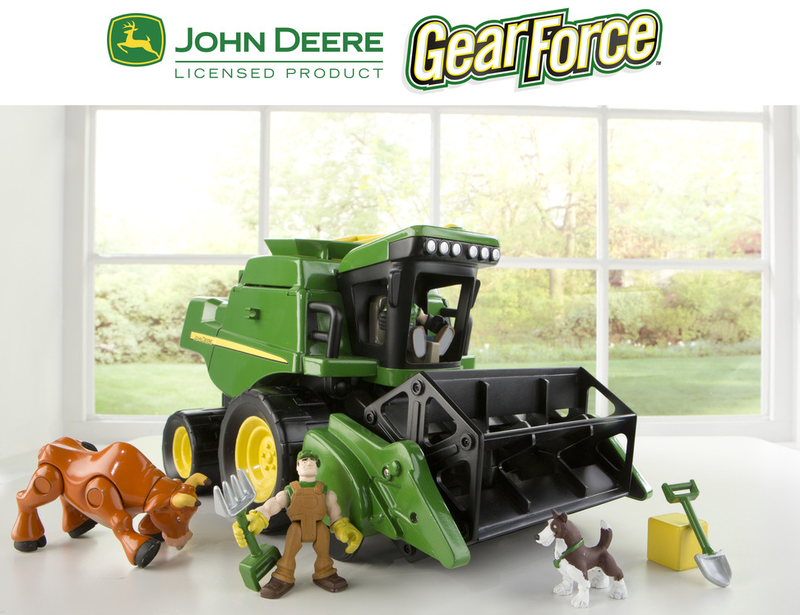 Made especially for the preschool crowd, this new Gear Force toy will provide endless farm and off-road fun for both boys and girls. 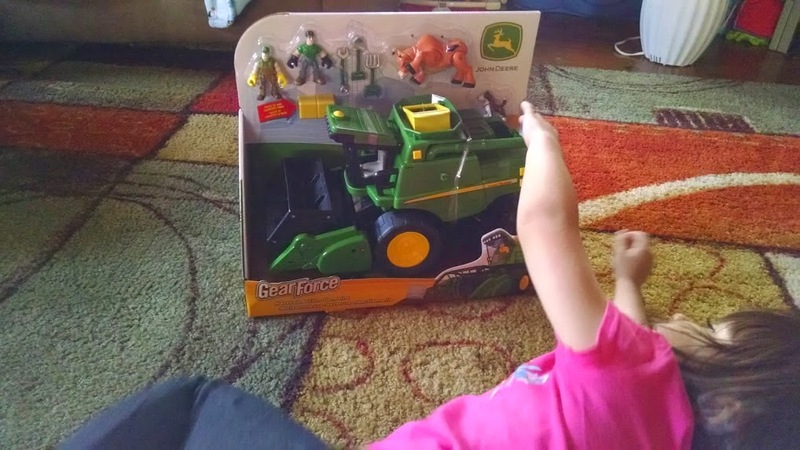 My daughter was quick to bring her Harvest Action Combine toy to school for show and tell, and I was there to watch as both the boys and girls sat up and took notice as Savannah demoed all the bells and whistles of this really cool Gear Force action-packed toy vehicle, from the award winning John Deere toy line. The brand new ultra-powerful Harvest Action Combine, which hit store shelves this fall, is the largest vehicle in the John Deere Gear Force fleet. Like the other vehicles in the popular Gear Force set, this new action packed toy vehicle "is a complete adventure in a box, that encourages imaginative play, with poseable characters and animals, functional equipment and accessories that can all be used to create fun stories and adventures. The Harvest Action Combine features lights and sounds, opening side panels, plus the ability to pick up corn and launch it out of the hopper. The playset also includes Jackson (a farmer), Hank (a construction worker), a raging bull that’s ready to charge, a dog, and thematic accessories: a shovel, wrench and pitchfork. 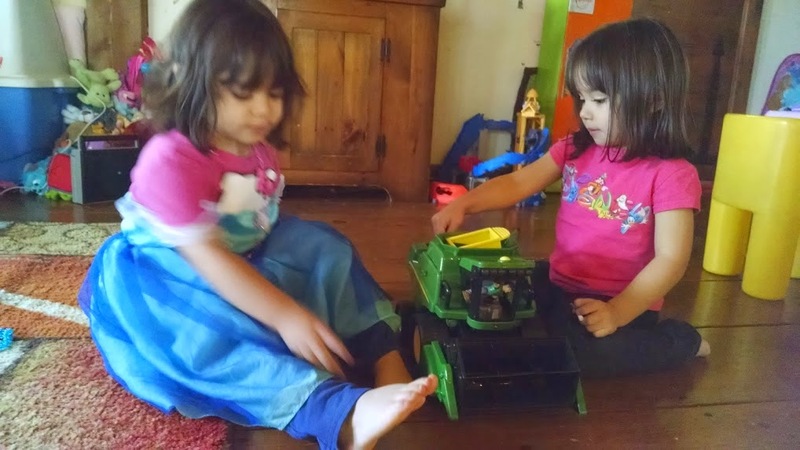 We have had the John Deere Gear Force Harvest Action Combine for a couple of weeks now, and the girls continue to play with it every day. 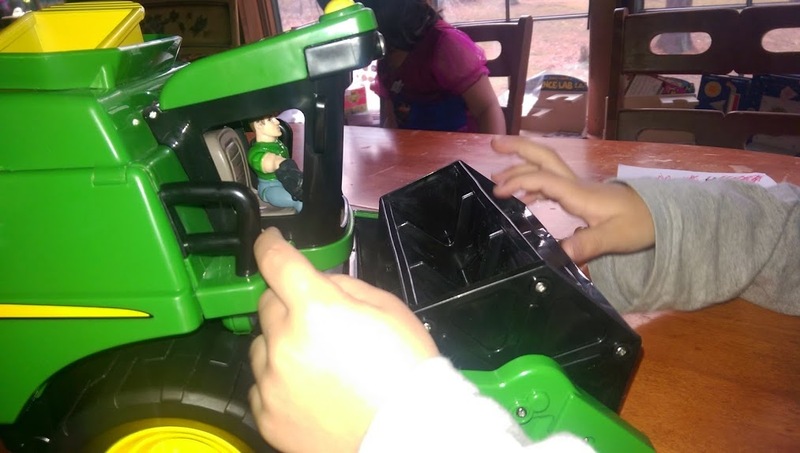 And, since Savannah showed it off at her preschool, she has gained quite the following of both boys and girls who want to come over for a playdate to play with this and her other John Deere toys. 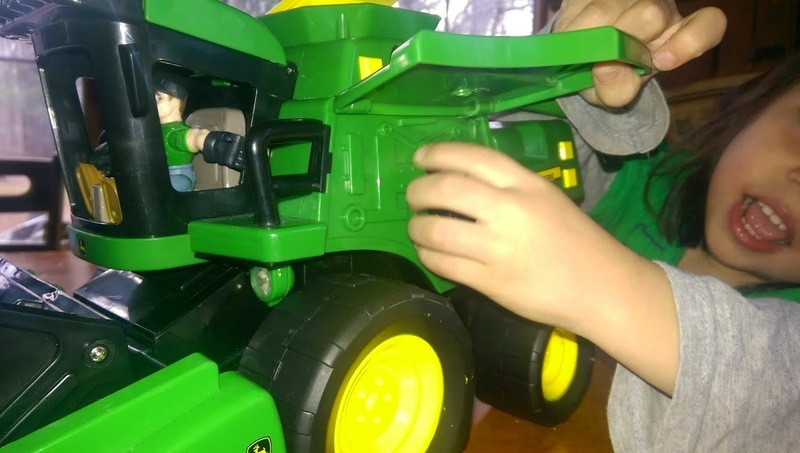 And, I have heard from many moms at Savannah's school that their children have asked Santa for the John Deere Gear Force Harvest Action Combine. 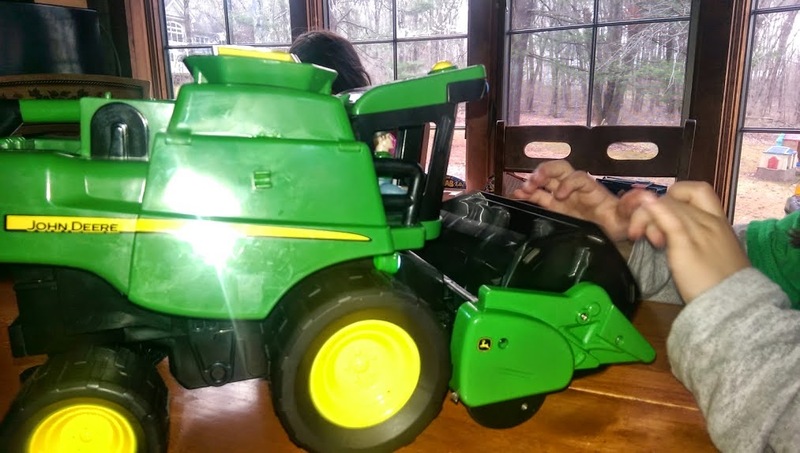 :-) Once you see this toy up close, you will see why my girls and so many other children (both boys and girls) love the award winning John Deere toy line. The Harvest Action Combine features different sounds and flashing lights, as well as opening side panels and doors. The Harvest Action Combines comes with corn cubes that when placed in front of the truck then it "swallows" them in and pops them right out; throwing them up in the air for kids to catch. It includes accessories including a shovel and screw driver, as well as two figures, a bull and a dog, all of which my girls loves to play with. Savannah especially loves the bull and will pretend that it is being chased, or is charging the Harvest Action Combine. Savannah was quick to point out and say that the vehicle works best when used on hard surfaces rather than a carpet, as it tends to get caught by the front wheels when you are pushing it around. She has been playing with the Harvest Action Combine at the dining room table before school, or while waiting for dinner to be ready. The Harvest Action Combine is made very well and will provide hours of learning and imaginative play opportunities for little ones, who are fascinated with the inner workings of a machinery like tractors, as well as its shape and the different sounds it makes. I have never seen my girls get as excited about a toy as they have with the new Harvest Action Combine. 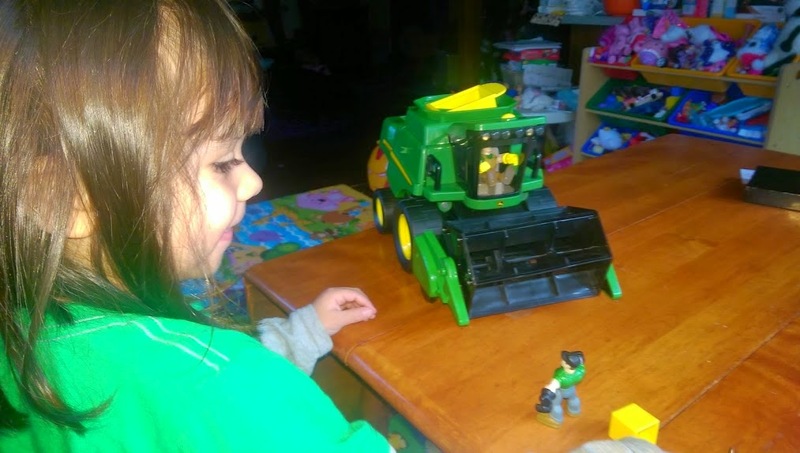 If you have a little John Deere fan in your life who is fascinated with the green tractors and farm vehicles, why not surprise them this holiday with their very own John Deere Gear Force Harvest Action Combine. And, be sure you have the camera ready as they open the toy, as they will be all smiles and not want to put it down until it is out of the box and on the floor with all it accessories and people, to be played with.